Federal Reserve Chairman Jerome Powell testifies Tuesday before the House Financial Services Committee in Washington. "My personal outlook for the economy has strengthened since December," he said. 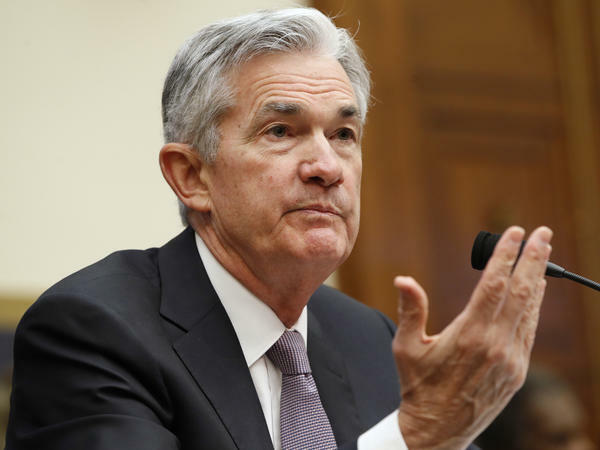 The Federal Reserve remains on track to continue increasing interest rates gradually to keep the economy functioning smoothly, Jerome Powell told Congress on Tuesday in his first testimony as Fed chairman. With a nod to the new tax-cutting law, Powell noted that "fiscal policy is becoming more stimulative" and he predicted inflation would rise this year and stabilize around the Fed's 2 percent target. "My personal outlook for the economy has strengthened since December," Powell told the House Financial Services Committee. Powell is providing the semi-annual report to Congress on the state of the economy and the Fed's monetary policy. He is scheduled to testify on the same topic before the Senate Banking Committee on Thursday. Powell replaced Janet Yellen as Fed chairman about three weeks ago and was immediately tested by turmoil in the stock market. Major indexes fell more than 10 percent but have since recovered much of that ground. Members of Congress will be interested in his views on market volatility and how the Fed will respond to it. Investors saw something to worry about in Powell's comments about rising inflation: They thought it made it more likely the Fed would increase rates faster. The Fed has signaled three quarter-point rate hikes for 2018 — the first likely to come at the next Fed meeting in March. Futures markets showed the odds of a fourth rate hike rising in response to Powell's comments. Stocks, which benefit from low rates, fell sharply Tuesday, while interest rates rose in the bond market. Though he said his personal outlook for the economy has strengthened in recent months, Powell declined to speculate on the views of other Fed officials. Fed policymakers will release a new set of projections in March. "I wouldn't want to prejudge that new set of projections," Powell said. Powell replaced Yellen after President Trump declined to nominate her for a second four-year term. In his opening statement, Powell acknowledged her contributions, pointing out that the economy had strengthened under her leadership. The new Federal Reserve Chairman Jerome Powell delivered an upbeat assessment of the U.S. economy to Congress today. That's got some people thinking the Fed might raise interest rates faster, as NPR's John Ydstie reports. JOHN YDSTIE, BYLINE: Powell was at the House Financial Services Committee to deliver the Fed's twice-yearly assessment of the U.S. economy. It was his first appearance before lawmakers since taking over at the Fed three weeks ago. And Powell indicated his support for a gradual increase in interest rates. That's a strategy the Fed adopted under former Chair Janet Yellen to get official rates to more normal levels after holding them near zero to support the economy after the financial crisis. But Powell seemed to suggest a more robust U.S. economy might mean the Fed will move rates up faster. JEROME POWELL: We've seen continuing strength in the labor market. We've also seen continued strength around the globe. And we've seen fiscal policy become more stimulative. YDSTIE: Fiscal policy as in the big tax cut and the recent budget agreement that will substantially boost government spending. Tight fiscal policy was a headwind slowing the economy in past years. But now, Powell said, it's become a tailwind. And the new chairman suggested all that economic stimulus would move inflation higher. POWELL: We've seen some data that will add some confidence to my view that inflation is moving up to target. YDSTIE: Inflation has been running below the 2 percent level the Fed believes is best for the economy. But investors saw something to worry about in Powell's sunny comments. They thought it made it more likely the Fed will increase rates faster. Right now the Fed has signaled three quarter-point rate hikes for 2018, the first likely to come at the next Fed meeting in March. Futures markets showed the odds of a fourth rate hike rising in response to Powell's comments. Stocks, which benefit from lower rates, fell sharply today, while interest rates rose in the bond market. John Ydstie, NPR News, Washington. Transcript provided by NPR, Copyright NPR.